A new poll of registered voters showed Democratic front-runner Hillary Clinton with a slight lead over Donald Trump in a general election matchup, but the presumptive Republican nominee continued to excel among white males. The Quinnipiac University poll released today had Trump leading among white men and white women, with the gap most pronounced among white men without a college degree. The poll had Trump leading Clinton among white men, 60 percent to 26 percent, in a head-to-head matchup. Among white women, Trump had a 1 point lead, 41 percent to 40 percent, which was within the poll's margin of error. Trump also led slightly among registered voters who do not have a college degree, 43 percent to 42 percent. Among registered voters without a college degree, his lead was largest among whites, with 55 percent favoring Trump to 28 percent favoring Clinton, according to the Quinnipiac poll. College-educated white registered voters preferred Trump to Clinton, 46 percent to 38 percent, but among all college-educated registered voters, the lead flips, with 47 percent for Clinton and 39 percent for Trump. In the most recent ABC News/Washington Post poll, released May 22, Trump led Clinton among men overall (56 percent to 34 percent), white male college graduates (59 to 33) and white men without college degrees (76 to 14). All three of those groups showed an increase in preference for Trump since the previous ABC News/Washington Post poll in March. The most dramatic difference was among white male registered voters without a college degree: In March, 65 percent favored Trump, against 26 percent for Clinton. Trump appears to be aware of his appeal among the less-educated. During his victory speech in Nevada in February, Trump said, "We won with the highly educated, we won with the poorly educated. I love the poorly educated!" 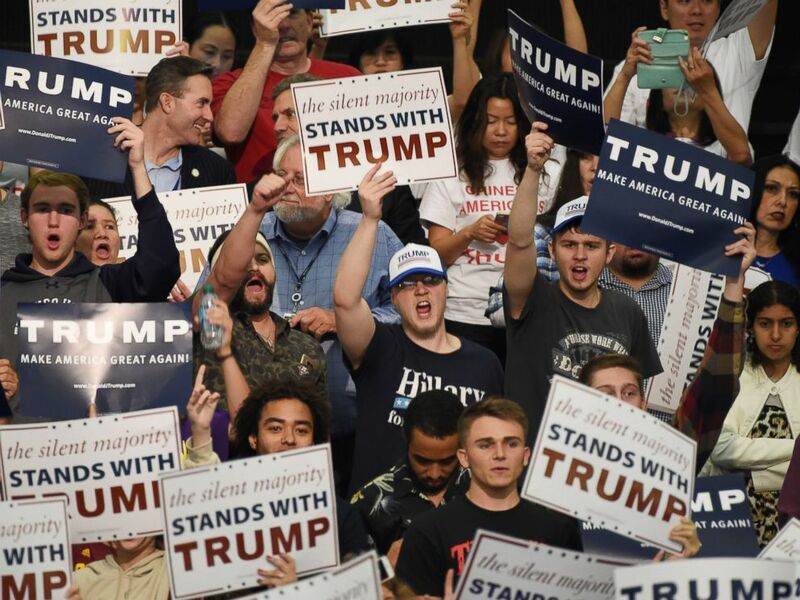 PHOTO:Supporters of the presumptive Republican presidential candidate Donald Trump attend a campaign rally, May 25, 2016, in Anaheim, Calif.
Trump's policies appeal to white working-class men because of how the country has changed in the past several decades, said Bruce Cain, a political science professor at Stanford University in California. "This is the group that economically and socially have lost the most ground in America over the last 30 or 40 years," he told ABC News on Tuesday. "There was a time when, by virtue of being a man, you could feel superior to women in the workforce. There was a time when you could make a pretty good living in manufacturing, and that’s disappearing. There was a time when you didn’t feel a lot of competition from immigrants ... and that's disappearing." Cain said Trump isn't the first politician to suggest solutions appealing to the white working class. "Look at Pat Buchanan or you look at Sarah Palin, Michele Bachmann — all these people have, in various ways, tapped that same thing. But add to that a celebrity businessperson who had his own reality-TV show. Throw that on top of a real instinct for the jugular, which Donald has. You've got the perfect spokesman for these people," Cain said. James Campbell, a professor of political science at the University at Buffalo in New York who has written a book about political polarization, said Trump's treatment of women has led to a larger gender gap than if he simply relied on those "who have been disappointed and left behind in recent years." "Many of them would be white males," Campbell said. He added that with Trump's "loads" of interviews with Howard Stern, his jabs at Fox News anchor Megyn Kelly and former GOP candidate Carly Fiorina and Clinton's appeal as the first female likely nominee, it "all adds up to a whopping big gender gap." Editor's note: An earlier version of this story incorrectly stated the poll numbers on white women supporting Trump and Clinton. The story has been updated.